Between 1947 and 1949, Zionist paramilitary forces ethnically cleansed and eradicated over 500 villages and cities in Palestine, displacing 750,000 Palestinians and taking over 78% of the land. Palestinians call this process the ‘Nakba’, or catastrophe. Today, an estimated 7 million Palestinian refugees are scattered around the world. These refugees are denied their right of return by Israel; a right demanded by tens of thousands of Palestinians protesting in Gaza since March 30. 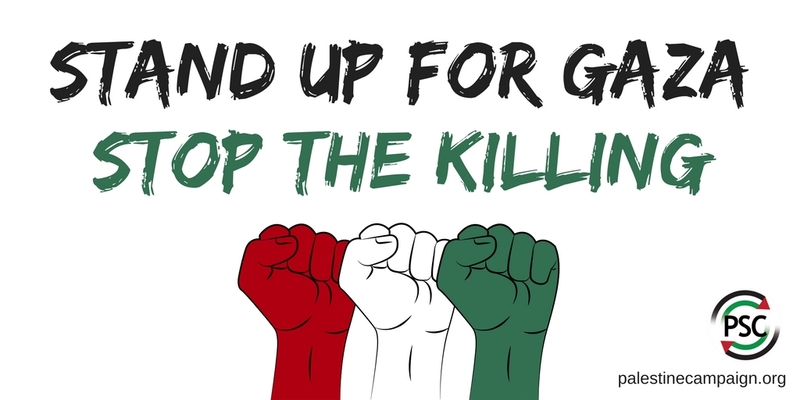 As of May 3, over 40 protesters at the ‘Great March of Return’ have been killed inside Gaza by Israeli snipers, including journalists and children. A further 5,500 protesters have been injured; over a third with live ammunition. When did the Nakba end? 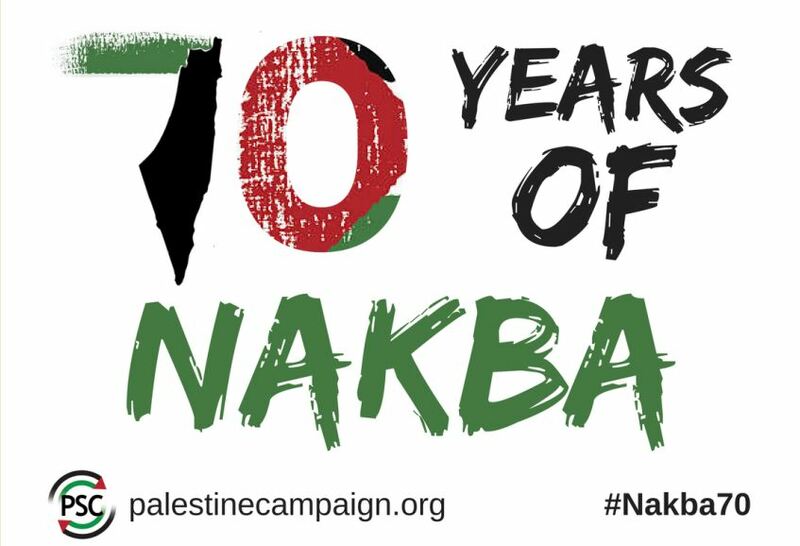 The Nakba did not end in 1948. Israel routinely uses lethal violence against Palestinian civilians; demolishes Palestinian homes and villages; imposes apartheid policies upon Palestinians in Israel and the occupied territories; colonises Palestinian land through unlawful settlement building; and imprisons both adults and children in a military detention system notorious for torture and ill-treatment. In May of every year, Palestinians and people of conscience around the world come together in recognition of this ongoing catastrophe. dissects the present, and looks ahead to a better future. 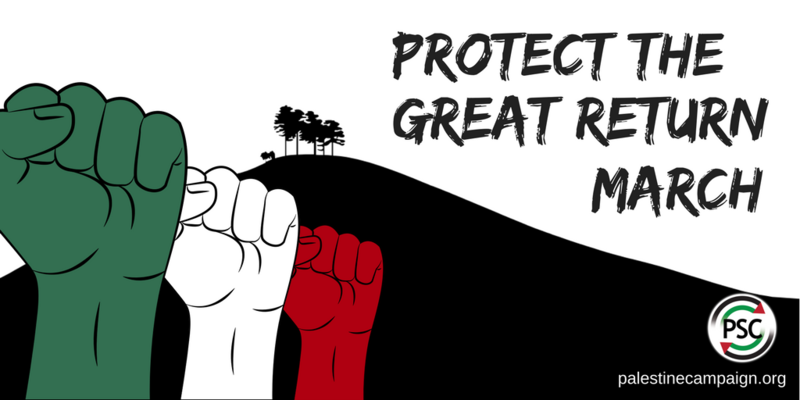 Attend the national demonstration in London on May 11th in solidarity with Palestine after 70 Years of Nakba and in protest at Israel’s premeditated murder of peaceful protestors at the Great March of Return in Gaza. Attend the PSC Right of Return Conference on May 20 and the festival, @70: Celebration of Contemporary Palestinian Culture , from May 14 to 20. Become a member of PSC and donate. Your support keeps the movement for freedom, justice and equality in Palestine thriving.